POEMS AND LYRICS. By ROBERT W. BUCHANAN. Glasgow: Thomas Murray and Son. MODERN society, notwithstanding all its searing influences, is pervaded by an ever-active spirit of poetry. That such is the case, is abundantly evident from the complexion of the stream which, as from an inexhaustible fountain, is ever issuing from the press. Another, and another, and another, streameth forth the grand procession of the books. Now it is a stately and sonorous history—now a hard-featured and crabbed-looking treatise on science; again it is a creation of fiction—mirthful or serious—“holding the mirror up to nature;” and anon, it is an utterance of song, haply in all the pomp of the epic, but far more frequently in the less ambitious shape of lays and lyrics swelling forth from souls which love to pipe a simple song to gladden the hearts of their fellow-men. The number of the minstrel tribe in modern days is indeed great. They are of all ranks and degrees of excellence, from Tennyson, upon whose honoured brow is wreathed the laurel of an assured immortality, down to the most lowly and illiterate metre balladmonger who ever counted his fingers in the vain attempt to make his verses clink. Yet ever as the “gude black prent” comes forth, we love to greet the successive aspirants to poetic honours, and to scan their several offerings to fame. In this way we have often met with good grains among the chaff, and beadings of finest gold where we had only looked for gravel or clay. The latest contribution to the literature of the lyre—at least the latest which has come under out notice—is by the author of the little volume the title of which heads the present article. From the preface—a modestly-written prelude to the poetry—we learn that Mr Buchanan is a very young man, and that the greater number of his productions were penned before he had attained his sixteenth year. On this ground he appeals to the kindlier feelings of the critic, and truly reminds him “that the bark of youth is necessarily more abundant in sail than in ballast.” That the generality of the fault-finding brotherhood will make due allowance for the juvenility of the poet we have no doubt, although there may be a testy old buffer here and there who will growl at the appeal. Such a one, we flatter ourselves, we are not. Remembering that Cowley and Pope both lisped in numbers, we have always scanned the pages of the young poet with interest; not in the expectation of meeting with anything like profundity of thought or maturity of style, but, if possible, to discover what of promise lay within his pages. The child has been said to be the father of the man, and in the lineaments of the child there are often indications of the future man. In the poems and lyrics of our youthful author, for instance, we imagine we can discern the luxuriance of a spring which may yet develope itself into an abundant harvest. These are but the firstlings of the year, and yet, from their appearance, we are led to dream of nodding ears of gold and branches bending under their loads of mellowing fruits. In the little volume before us there are pieces in a considerable variety of styles. We have, for instance, “Mary Gurney,” a tale of sin and sorrow, in very fair blank verse; “Extract from an unpublished Play,” a dramatic effort of much poetic beauty; with lyrics in various measures and cadences, and a sprinkling of sonnets of considerable vigour both as regards language and sentiment. In all these measures we can detect the fine ear of the future poet, with a profusion of fancies and conceits which time will yet teach him to prune into a more chastened, and consequently, more attractive beauty. That there are occasional errors in taste and certain extravagancies of imagery, combined occasionally with certain crudities of thought, is what we must not deny, and certainly is what we should only have looked for in the writings of so young a bard. Enjoyment and sorrow, love, hope, disappointment, and doubt, must all be experienced before the poet is properly ripened for his mission, and is fitted to grapple with the deeper mysteries of his art. Time is the great teacher, and our author will do much better things when he has been a little longer in the grim old fellow’s school. All the live-long, sunny day. Wondrous wooing of the May. Heart and head the live-long day. ’Mid the merry, merry May. Marble all the merry May. Frozen ’mid the golden May. ’Mid the madly mocking May. This wooing of the May. O, the silly, vain coquetting. Empty shadows, cold as gay! Loveless daughters of the May! But we must conclude, and, in doing so, we beg to offer the young bard our best wishes. May his elegantly got up and beautifully printed volume—the first-fruits of his genius—prove a great success, and tempt him at some future and more mature period of his life to scale again the brow of Parnassus, and to glean the flowers and the fruits, the tendrils and the leaves, which he may be privileged to gather on his onward and upward way. Since first he took to walk on ten toes. Do mothers still their school-boys pamper? O, how I hated Doctor Wise! O, how I lov’d a well-fill’d hamper! And sad enough of friends departed. He never paid me back a stiver. A donkey upon that occasion. How mad I was when first I learnt it! I’d give a trifle to have burnt it. Their perfume is as sweet as ever. Had got a pair of chimney corners. Go, Betty, fetch a lighted candle. The two last lines of the last stanza but three, “Though hope though passion may be past,” &c., are the best of it. To breathe a new life on the strings of my lyre! Awake! awake, my mournful strain! My stout! my gallant bay! So honest and so gay! He was so full of symmetry! My brave! my noble steed! And never off his feed! His quarters long and full! His temper was so cool! Nor burnt a hair away! But we soon slide back again into “He gasped upon the verdant sward,” and “The fate of one I loved so well, chilled every pulse with icy spell”—very withered leaves indeed! Till they lay them down to die. Mr. Jewitt’s poems appear to have come into the world before their time, for the date on their title-page is 1858. They ought still to be in the womb of the future. Perhaps this accident may in part account for their weakliness. BENEATH BEN CRUACHAN BY DAWN. The bee it carols o’er the mellow corn. King Cruachan, bleak monarch among hills. Of regal pride illumes his features old. High on his brow pure speech, with Beauty—God! we hold. “coeval” with the clouds, or is the epithet used promiscuously? Across the wold, one moment’s quiet find. The lint-white locks that deck her helpless head. In the poems written before sixteen, are some things which, in point of sentiment, as well as composition, require and may plead the excuse of youth. For the three last of these four bards, we can only wish them a safe passage over the Styx, sedibus ut saltem placidis in morte quiescant. It is very melancholy, but if such subjects will come before the tribunal of public criticism, there is no help for it; they must be judged. If they spun the paper and type out of their own brains, as well as their ideas, their diversion would be more harmless, and critics might be disarmed. * London Lyrics. By Frederick Locker. With an illustration by George Cruikshank. London: Chapman and Hall. 1857. Withered Leaves. By Rusticus. Edinburgh: Edmonston and Douglas. 1857. Antennæ. Poems by Llewellynn Jewitt, F.S.A., &c. London: Longmans. Derby: R. Keene. 1858. Poems and Love Lyrics. By Robert W. Buchanan. Glasgow: Thomas Murray and Son. Edinburgh: Sutherland and Knox. London: Hall, Virtue, and Co. POEMS AND LOVE LYRICS. By ROBT. W. BUCHANAN. Wash’d on sleep’s shore by the soft tide of dreams. In another of his lyric effusions—“Love’s Heaven,” his soul “growing and soaring, and brightening” in the “pure sparkling bliss of holy communion,” is compared to “an April bud opening into its May,” and again to “a poor heath sprig, yet bright in its morning,” for his life’s one bright particular sun has “kissed the dewy-drop” glittering on his stem, and shines “stainless and clear.” We regret that some of the finest pieces in the volume are too long for quotation, and a mere extract would give but an imperfect idea of them. We may, however, refer to “Wooing” and “Waiting,” and to his song “Be Bold! the fields of Summer Green,” as among his better efforts. Beneath his tyrant hand, the clutching wind. The porpoise rank and shark are vomited. With its own killing breath. Hugging black Night, his drunken paramour. Up ever from their crimson throats. So high on tiptoe leant I up to God. Oh! Christ, in truth it was a glorious land. Of Care, while anguish chokes mine eyes. The author having placed himself in the above public position may be safely left there. O Scotia! O Muses! North of Tweed we are surpassed in everything—even in spasmodism! 6 “Poems and Love Lyrics.” By R. W. Buchanan. Glasgow: Murray and Son. London: Hall and Virtue. 1857. POEMS AND LOVE LYRICS. By Robert W. Buchanan. Glasgow: Thomas Murray & Son. This little volume of poems is by a young man belonging to this city, and he states in the preface that, with one or two exceptions, the contents were penned before he was sixteen years of age. We think his friends committed an error in allowing him to publish his book at the present time, as it contains too many things which ere long he would of his own free will have obliterated. Among the recent productions of our minor bards generally there is one feature which we have noticed, and which seems to us a very objectionable one. We mean the custom of writing chiefly about women who have “loved not wisely but too well.” This seems to be the staple article of manufacture with our young poets, and we can scarcely light upon any of their books which does not contain some spasmodic pieces of this kind. That a young man under sixteen should make use of such materials so freely seems to us very objectionable and improper. Passing over this, however, and the occasional use of too strong language, we find some very good poetry in Mr. Buchanan’s book, and had he only been judicious enough to wait a few years, we doubt not he would have sifted the good from the bad, and presented us with a very acceptable volume. As it is, the book gives promise of something yet to come which will be highly creditable to the young author. He has evidently a good imagination, and a power of expression which will do him service. Several of the pieces are expressive of the genuine fire, and in such of them as contain a plot, it is good. We shall look with some degree of interest for Mr. Buchanan’s next effort. The first book of verse sent out by Robert Buchanan was not “Undertones,” but “Poems and Lyrics,” a thin volume published before the author came to London. The book was dedicated to Hugh Macdonald, who forty years ago, was a well-known writer of local sketches in the Glasgow Citizen. 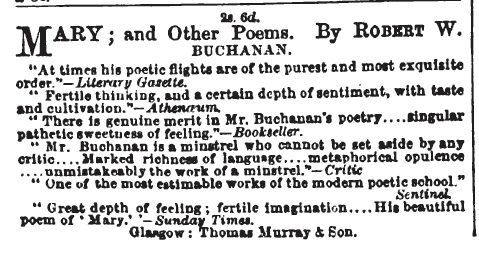 In a prefatory note which is humble and apologetic in tone Mr. Buchanan states that the most mature of the poems, with the exception of three sonnets, were penned before he had attained his 16th year. Embosoming the beauties of the hours. With such extracts we must now rest, contenting ourselves with so far having overtaken an agreeable task, while at the same time believing the notice we have given is sufficient to increase an interest in this recently published volume of verse. Having promise of becoming an acceptable addition to our modern poetical literature, it is wit the more regret that we have hastily perused even that portion of this volume we have particularly chosen to refer to. 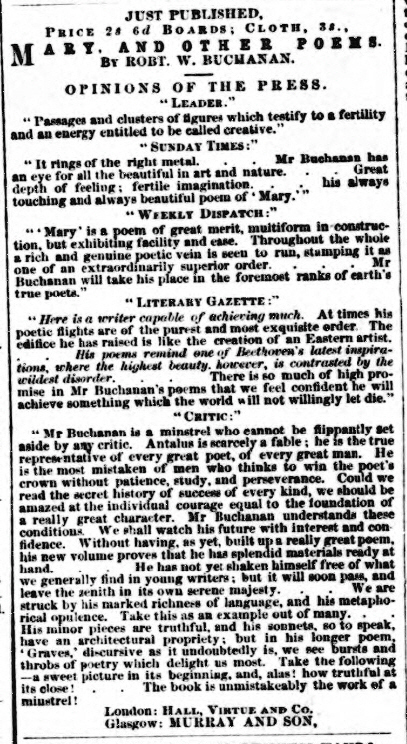 The Mary and other Poems of Mr. Buchanan, does not support the promise of that future excellence which friendly critics anticipated from his “Lyrics.” In a preface where humble-mindedness does not predominate, the author refers his readers, not to “Mary,” or a longer poem called “The Graves,” but to his sonnets and minor pieces. These no doubt are better for the reader, inasmuch as they are shorter; but we question whether, length for length, they exhibit more poetry or more finished workmanship. Mr. Buchanan’s mind is not devoid of vigour and power, but he scarcely exhibits that something which we feel to be poetry, though we cannot define it; and he is prone to let himself run to seed. As a first production there would have been promise in his book. As a second designed to fulfil the expectations of a hopeful first, it is rather a failure. London: Hall, Virtue, and Co.
Mr. Buchanan, the author of this volume, has certainly the germs of poetry in him; and if he will prune and restrain his muse, rather than force her beyond her strength, he may do well. She will be a credit and comfort to him, but she will not put bread on his table, should he unfortunately expect that from her. The preface betrays more humility of expression than of feeling, and the dedication to Mr. Gilfillan is significant, as that gentleman is apt to raise false hopes in his proteges. It is very common for men of poetical temperament not to know how to use the riches of imagination, which they possess. Let Mr. Buchanan remember this, and neither flatter himself nor let others flatter him. He can now write prettily; with time, labour, and care, he may probably write well. If friends will tell him that he can write what Tennyson might be proud of (vide Critic), let him shut his ears to the deluding misjudgment, and rest assured that such competition is altogether out of his reach. AN UNKNOWN VOLUME OF ROBERT BUCHANAN.